Our friend Bobbi posted a super fun contest on her blog this week. 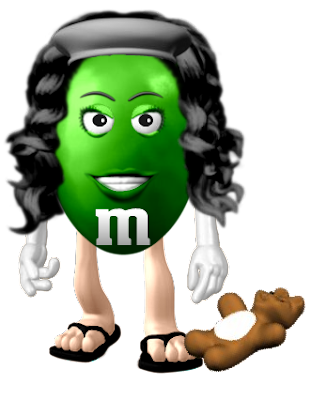 The contest is to see who can make an m&m on m&m's website and make it look the most like themselves. Well, of course we had to get in on the fun. 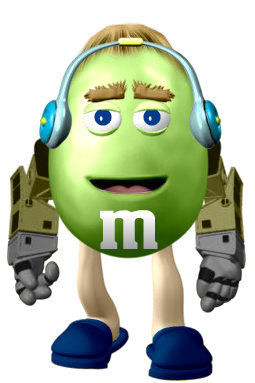 Here's an m&m I made of John. You'll notice the headphones that are attached to his head all day while he works in his studio and of course his slippers are because he works from home. The robot transformer arms? Cuz he's my techie nerd and I wouldn't have it any other way. Here's John's take on me. He says the hat matches one that I usually wear in the winter. He's says it shows my "hyper, but mellow" personality. I'm guessing the bear is for Miles. 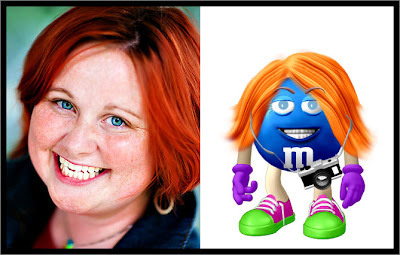 For more, and MUCH more creative m&m's from some of Bobbi's adorable bloggers, check out Bobbi's blog at: Bobbi's Blog You will be amazed by how much these m&m's look like their creators. There is even a dog m&m that cracked us up. Oh, and you can vote for your favorite as Bobbi is giving out a prize. Actually, the one I made for John is in the top 7, so check out the competition and vote accordingly! Her hubby Mike's m&m is hilarious too, but I'll make you go to her website to check it out.